Lately, whenever I approach our composting area I get chittered at and swooped by a pair of willie wagtails. This almost always means they’ve built a nest nearby, so I spent a bit of time with the kids looking for it. 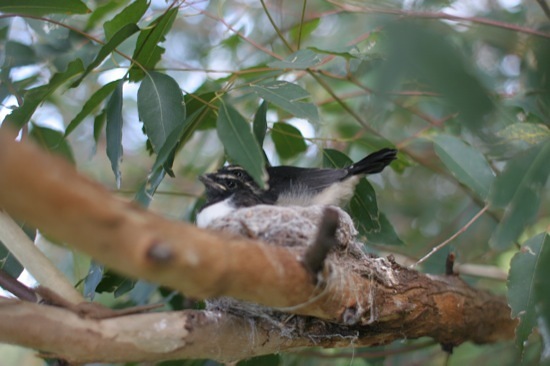 Willie wagtails are great birds to have in the garden, so we’re happy to leave them in peace to raise their babies. These little guys are insectivorous, so hopefully they’re enjoying a diet rich in cabbage white butterflies, fruit flies, mosquitoes and other garden pests! I remember seeing a willy wagtail in one of the ‘Dot’ movies as a kid. Dot and the Kangaroo etc – am I showing my age here? I’ve never seen one in real life – thanks for sharing the lovely photos, and I hope he helps you out with all the pesky bugs. @L: We must be of similar age, because I remember those movies too! We’ll certainly be looking after this little family and encouraging them to stay. 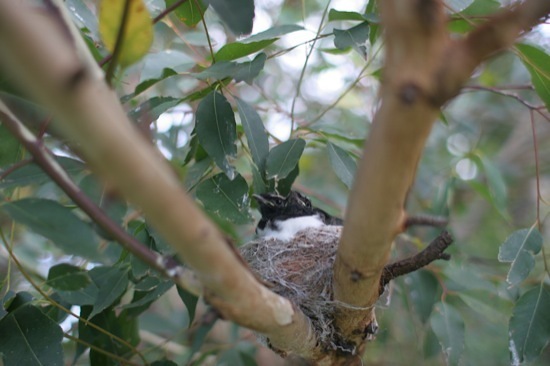 Oh you are so luck to have some willie wagtails in your garden. 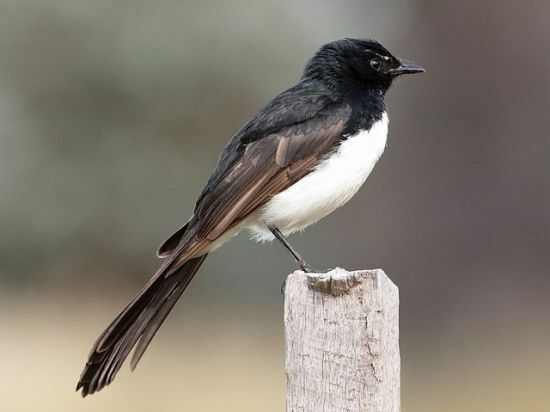 I have planted my garden up so profusely with native plants, (and mostly Indigenous to the area) but I still have never seen a willie wagtail. I do get my dose of wagtail when I am working in the bush which is great but I do wish they would discover my garden. @Meg: We do enjoy the birds. I’ve no idea how to attract the willie wagtails, though. I’d like to see more of the tiny finches in our gardens, so need to research what attracts them.